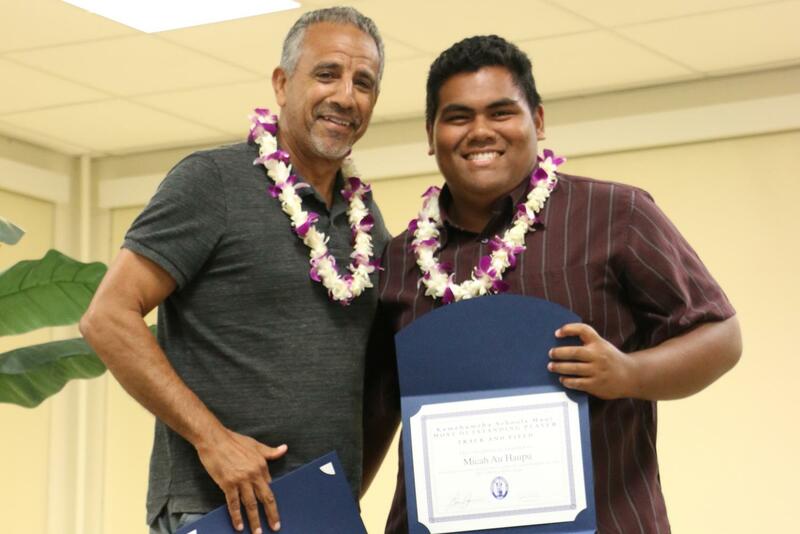 Senior Micah Au-Haupu receives the Most Outstanding Athlete award for track and field from Coach Rudy Huber. Gold shimmered around two Kamehameha Schools Maui athletes for the first time in Hawaiʻi High School Athletic Association Track and Field history this Saturday at the 2018 state meet. 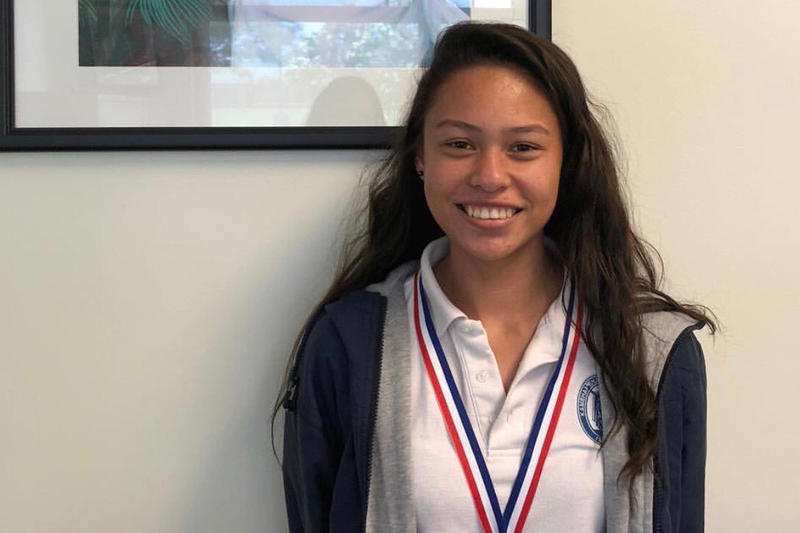 Junior Keely Logan and senior Micah Au-Haupu were two of the ten Maui athletes to receive a gold medal this year. Logan medaled in girls high jump at 5 feet 1 inch, and Au-Haupu medaled in boys shot put with 51 feet and 3.25 inches. Freshman Teija Tuitele, junior Kiana Over and senior Hunter Worth also brought home medals. Tuitele tied for seventh in pole vaulting (10 feet), Over placed fifth in long jump (16 feet 7 inches) and Worth placed ninth in pole vaulting (12 feet 10 inches). 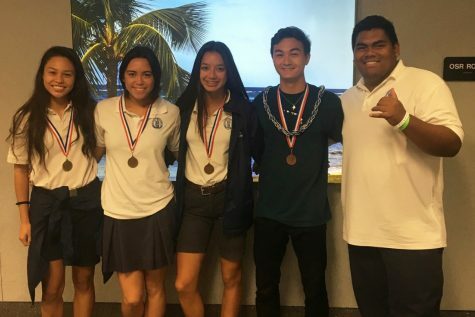 Juniors Keely Logan, Kiana Over, freshman Teija Tuitele, and seniors Hunter Worth and Micah Au-Haupu bring home medals from the 2018 HHSAA track and field competition. Overall in the state, the KSM girls tied in 14th place with Mid-Pacific, and the boys tied at 15th with Waipahu and Castle. Logan and Au-Haupu had a big part in boosting the teams’ points with first-place finishes, but their work couldn’t have been possible without their rigorous training and determination throughout the season. Junior Keely Logan brings homes state gold in girls high jump. Throughout the Maui Interscholastic League season Logan was ranked first in the state for girls high jump. She said that most of her training was mental, constantly reminding herself that she wasn’t just there to compete, she was there to win. At the state finals, to test her strength even further, Logan had to compete in a jump-off against ʻIolani’s Kellie Okamura for the gold medal. In a jump-off, the two competitors make one more attempt at the height at which they failed. If no decision is reached, the bar is lowered in 1-inch increments. If two or more of the tying contestants clear that height, the bar is raised in increments of one inch. Each competitor attempts one trial at each height until a winner is determined. “It kept going back and forth between us, but she missed her jump at 5 feet 1 inch, and I made it,” Logan said. At first, Logan didn’t notice she’d won gold. It wasn’t until her cheering teammates came running up to hug her that she realized she had won. Logan plans to return next year to defend her state title and hopes to jump over a height of 5 feet 4 inches. In preparation, she will begin training for the next year’s season in about two weeks. Senior Micah Au-Haupu brings home state gold in the boys shot put competition. Au-Haupu’s journey to gold was similar. Training in shot put since he was young, he always kept “positive and visualiz[ed] winning” with the same type of vision Logan had. During the MIL regular season, Au-Haupu threw a distance of 51 feet and 5.5 inches, 2.25 inches farther than his HHSAA throw. Like Logan, Au-Haupu did not reach his personal record of 52 feet 5 inches at the state meet, and getting to the gold was not easy. It came down to the top two in the finals. In the end, Au-Haupu overcame Punahou’s Alama Uluave, beating his throw distance by a mere quarter of an inch. “When I found out I won, it was sigh of relief,” Au-Haupu said. After years of preparation, his work finally paid off when receiving the gold. Although Au-Haupu is graduating, he plans on continuing his training and shot put career. Au-Haupu has signed with St. Martin’s University for collegiate track and field and dreams about making it to the Tokyo Olympics in 2020. To see how these two athletes and the rest of the team performed at various meets, click here. Senior Iokepa Supnet prepares to hit the ball at War Memorial Stadium. The Warrior baseball team cheered as they looked at their 4-3 victory over Maui High School on the scoreboard. Senior Iokepa Supnet confirmed that the “highlight of [their] season” was clinching a spot in the state championship for the first time since 2011. 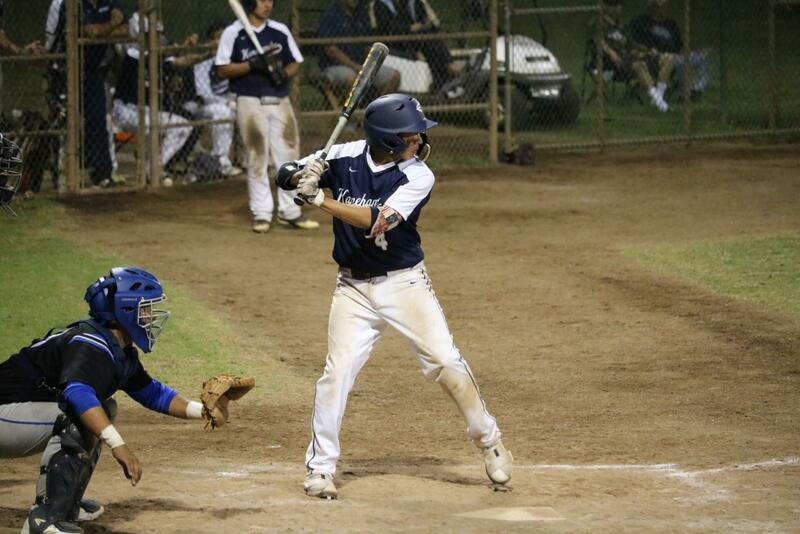 The Kamehameha Schools Maui baseball team made it to the state championships in 2009 and 2011 under the direction of Coach Brandon Kanamu. In 2009, the team played in the 2009 Wally Yonamine Foundation Baseball Championships at Les Murakami Stadium on Oʻahu. The team lost against Kamehameha Schools Kapālama, 3-1, and Pearl City, 14-2. In 2011, they played in the same tournament, at the same location. The team lost to Pearl City, 3-1, and won against Roosevelt, 2-1. This season, the Warriors won 11 games and lost 4. Their biggest competitor was Baldwin High School, who secured the first spot in the state championships this year, defeating Waiakea 14-4. In the state tournament, the Maui Warriors played their first game, May 8, against Campbell at Les Murakami Stadium, but lost 3-0. In the consolation semifinals the next day, they played Leilehua and tied 6-6, but because they had a combination of less hits and more errors, it was the Mules who continued to play in the race for fifth. “We were a few pitches and a few plays away from a different outcome, but the overall experience of playing in the state tournament is immeasurable, especially for the underclassmen,” Coach Mo said. 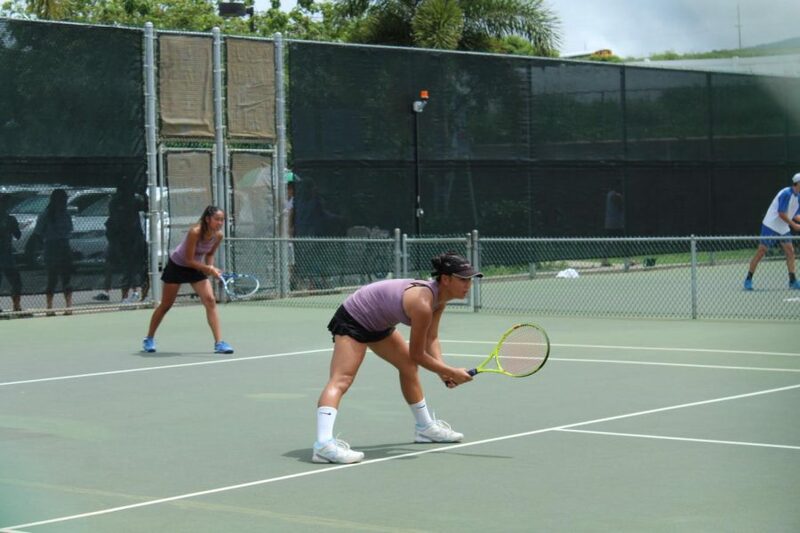 Kayleen Lau and Kaelyn Kato play against Campbell High, winning their first match in the HHSAA tournament held on Oahu. The boys and girls tennis team ended their 2017-18 season with junior captains Kayleen Lau, Leeana Kanemitsu, Lee-Joseph Franco, and senior Maikai Kaufman leading the way. “This year was amazing. 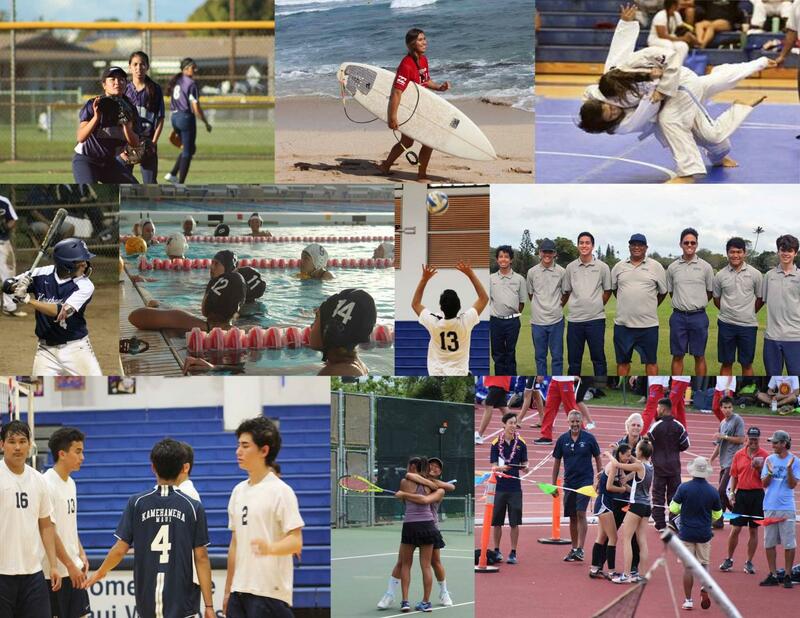 We started a little rough around the edges; however, as the season progressed, we became one ʻohana. All I can say is that I’m beyond blessed and honored to have played with the most enthusiastic, tennis-loving individuals I’ve ever met,” Lau said. This year, Lau and Kato won the Maui Interscholastic League title for girls doubles. 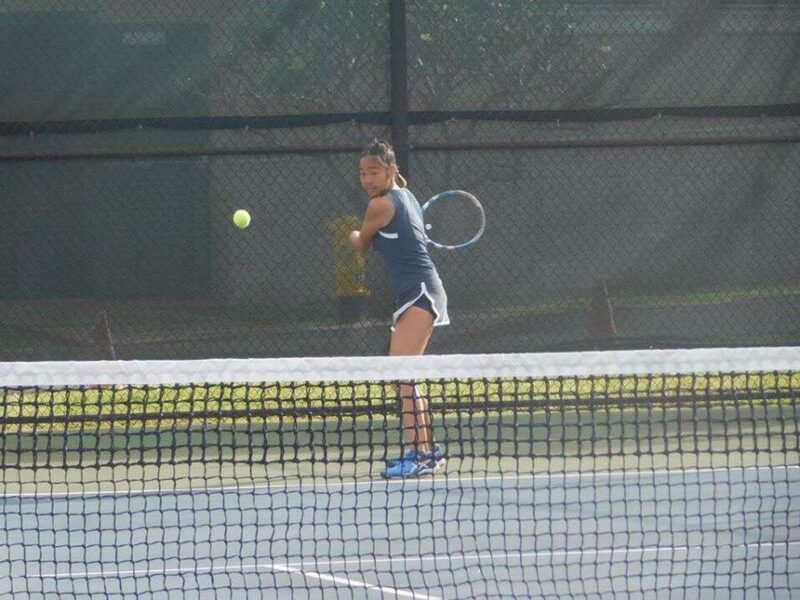 The girls competed in the HHSAA Tournament, and they defeated Campbell High School 6-0, 6-0, but fourth-seeded Punahou defeated the girls in the next round 6-3, 6-1. “At first, I was in shock [to have won MILs]. I couldn’t believe that we had won the MIL title because Kayleen and I have never practiced together and only played together once throughout this season. We had gone into the HHSAA tournament with an open mind, and we had a lot of fun,“ Kaelyn Kato said. Overall the team trained hard to succeed this year with many new members. “In the beginning, we struggled greatly with teaching such a large portion of the team how to swing a racket, but at the end of the season, everyone [who] improved far surpassed what I thought was possible for these kāne. We are looking forward to further improving our skills next year as we are hoping to retain most of our team members,” Lee-Joseph Franco said. Kaelyn Kato prepares to hit the ball. Senior Austin Peters sets the ball to senior Rafael Adolpho. Senior captains Austin Peters and Rafael Adolpho went into the 2017-2018 boys volleyball season with high hopes for their team. They aimed to compete in the New City Nissan Division 1 state tournament. The boys surpassed their goal by becoming Maui Interscholastic League champions and placing fifth in the state tournament. At the state tournament, the Warriors lost 3-0 to ʻIolani School. They made a comeback 2-0 win against Kamehameha Schools Hawaiʻi, and went 2-1 against Mililani High School. Last year was the first time KSM boys volleyball participated in a state tournament since 2009. This year, the Warriors were MIL champs once again. The Warriors lost five impact players from last year’s team: Bailey Dagupion, Keahi Jacintho, Hanalei Hoʻopai-Sylva, Keomaikalani Chun, and Haweo Johnson. Despite their loss, Peters said they filled in the spots and practiced harder to win the MIL championship title. The senior-heavy team had eight seniors, three juniors, three sophomores, and one freshman. The boys utilized their practice time by training every day and doing cardio with Coach Kevin O’Brien. “[The boys] were a motivated team, and their effort in the weight room demonstrated how motivated they were,” Coach O’Brien said. The Warriors will use this momentum to improve and work hard for the 2018-19 boys volleyball season. Senior Kamalei Roback carries her shortboard after competing at the MIL championships in 2017. This year she placed second in girls bodyboarding at the championship meet. Rain or shine, the winter brought the usual seasonal swells for this year’s Kamehameha Schools Maui surf team. 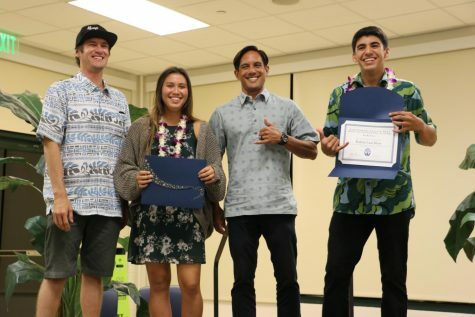 Regardless of the weather, seniors Kamalei Roback and Kahiau Luat-Hueu bodyboarded their way to second place and represented the Warrior spirit in the Maui Interscholastic League championship surf meet. During the regular season, the Warriors averaged a fourth-place team standing for boys and third-place standing for girls. Luat-Hueu and Roback helped keep their team competitive with their individual bodyboarding scores contributing to the team scores. Luat-Hueu earned a total of 2,556 points, and Roback accumulated 2,439 points. “We had weekly workouts with Coach Kevin O’Brien that pushed [us] to strive for greatness,” Luat-Hueu said. The MIL season consisted of four meets, which the Warriors prepared for with once-a-week dry-land training and 2-hour surfing sessions after school. 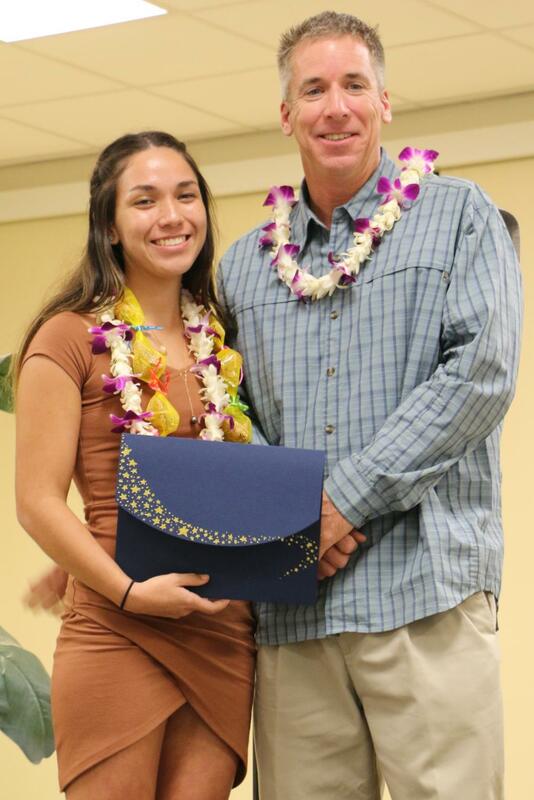 Seniors Kamalei Roback and Kahiau Luat-Hueu receives the Most Outstanding Athlete award for surfing. Most of the surfers, including Roback and Luat-Hueu, surfed on weekends to put in extra practice time. Roback didn’t let those feelings get to her. She found motivation in the ocean. “I love surfing because of the feeling you get after you get a good wave. The feeling is indescribable,” Roback said. Besides bodyboarding, Roback competed in shortboard, in which she totaled 1,850 points, placing her in sixth in the final MIL standings. For Luat-Hueu, it was different. His MIL surfing season started with a win at Fleming Beach Park. In the second meet at Koki Beach Park, Luat-Hueu fell behind the top nine standings. “I took a downfall at Koki, but that only fueled me to do better at the next meets,” he said. After the second meet, Luat-Hueu’s performance improved. He placed fifth at Lahaina Harbor and second in the MIL championship meet at Hoʻokipa Beach Park. He was awarded the boys Most Improved Surfer award and a brand new Manuela Shapes surfboard for his hard work and dedication. “I want to thank both [Luat-Hueu and Roback] for being good role-models and examples for the underclassmen and helping build our program for the future,” Coach Campbell said in the banquet awards slideshow. Although there isn’t an HHSAA state competition for the surfers, they were well represented at the MIL meet and in the final standings. This judo season took seven individuals to participate in the 2018 Atlas Insurance Agency Judo Championships on Oʻahu, May 5. Senior Anela Greig said the reason for their successful season was the close-knit nature of the team. “[The judo team’s] bonding made us closer from the start…anyone could see that [the team] was closer than last year,” Greig said. This year, the judo team welcomed new school-members senior Niya Matutino and freshman Ezekiel Matutino. The sibling pair dominated in their judo matches until the end of the season, where things got tougher because of the competitive progression of other schools. Sensei Ronald Hiyakamoto said that the judo team improved from the beginning of the season, with most of the teammates accomplishing their season goals. Greig said that King Kekaulike High School was one of their biggest competitors because of how close the KSM judo team was to them. Their connection to other schools never played a factor on the mats. Niya placed sixth in the girls 115 lbs. weight class, but the KSM girls judo team placed in the top twenty in the state competition. “Although [the girls judo team] didn’t place as high as [they] wanted to, [they] still stuck it through, and the seniors had their last take at judo,” Greig said. The boys golf team. Jordan Mitsumura and Dane Abarra competed in the HHSAA Boys Golf Tournament on Oʻahu, May 9-11. 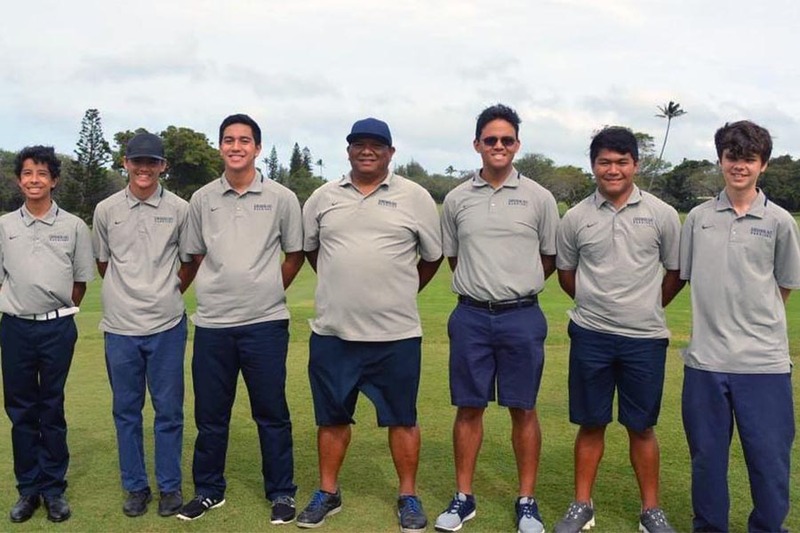 The boys golf team made it through the season with top competitors Kody Cambra and sophomore Jordan Mitsumura qualifying for the state tournament at the Maui Interscholastic League championships, April 13-14. Cambra’s best score of the season for 18 holes was 47 while Mitsumura’s was 41. The two boys shot their hardest until the MIL Championships. 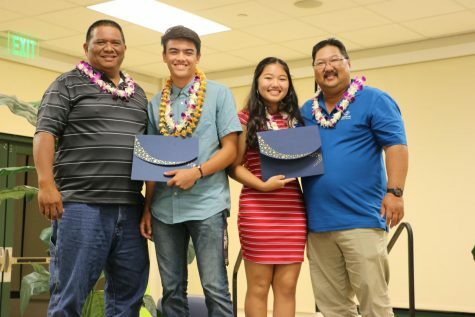 “[The boys golf team’s] biggest competitors as a team had to be Maui Preparatory Academy and St. Anthony Junior Senior High School,” Cambra said. He expected this much considering he has not played golf since he was seven years old and in junior golf. Cambra played golf when he was younger but grew out of the sport until recently joining the high school team. “Once my friend got me back into [golf], it was all over because I learned to love it and enjoyed the sport as a whole,” he said. Coach Kalani Abarra pushed the team and Cambra to shoot their best games this season and most of them did. The boys golf team of six gave it their all, and they had a great season overall. The boys bonded over weekend practice trips to the golf course, where they golfed, talked and enjoyed each other’s company. Cambra said he looks ahead to the next season, and he’s ready to start preparing by committing his weekends and free time to golf between now and then. “Golf is a sport that needs continual practice and repetition. The only way you can get better is by going out and actually playing the sport,” he said. The boys golf team had juniors Dane Abarra and Jordan Mitsumura competing in the HHSAA Boys Golf tournament. Abarra scored 90 and 82 for total of 172 and Mitsumura with 92, 86 and a total of 178. Coach Abarra, Jordan Mitsumura, Sherri Nagamine, and Coach Nagamine after the student-athletes were named Most Outstanding Player in golf. Junior Sherri “Hōkū” Nagamine represented for the girls as the only player on the team. 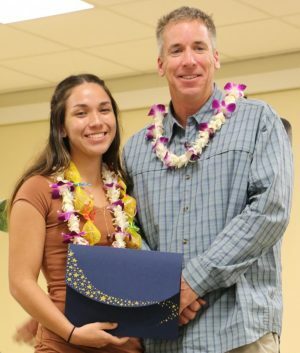 “Although she didn’t have a team to participate with, she qualified for the state golf tournament by finishing in the top six at the MIL Individuals,” her father/coach James Nagamine said when she was honored with the Most Outstanding Player certificate at the recent athletics banquet. He added that Nagamine was the only Kamehameha Schools girls representative from among the three campuses. “She played with integrity, humbleness, and a great finishing score of 75,” Coach Nagamine said. Hōkū scored an 86 in the first round and a 75 in the second round, placing her near the middle of the pack overall with a total of 161. Jordan Mitsumura was also named Most Outstanding Player, and, among his many attributes, Coach Abarra pointed out that Mitsumura’s work ethic is part of the reason for his success. 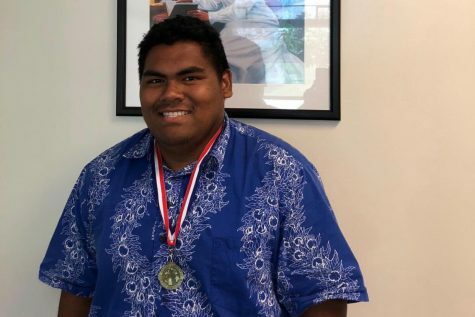 “He practices on his own; he’s always the first to arrive, and the last one to leave,” and although he demonstrates great problem-solving skills, heʻs never afraid to ask questions too, he said. JV boys volleyball comes together after their last game against Lahainaluna. 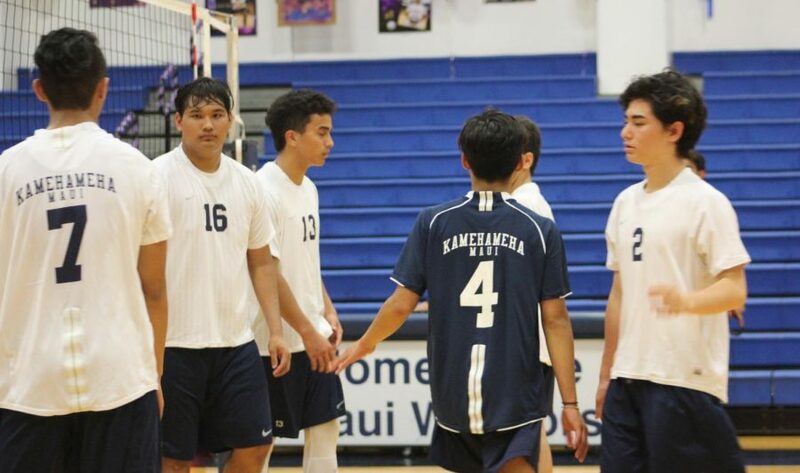 Kamehameha Schools Maui’s junior varsity boys volleyball team wrapped up their Maui Interscholastic League season with four wins and two losses. “The struggles we encountered this year was that we had two people that got injured [Bronson Espania and Gabe Arcas]. We didn’t have refs that came up to the games. It was a struggling season the whole time, but the boys were able to fight through it and come together as a team at the end. Overall, they made a big improvement,“ Coach Taylor Awai said. The spirit the Warriors had reflected in their athletic performance. There were many new players, including three freshmen and seven sophomores, but they came together as a team to play competitively this season. 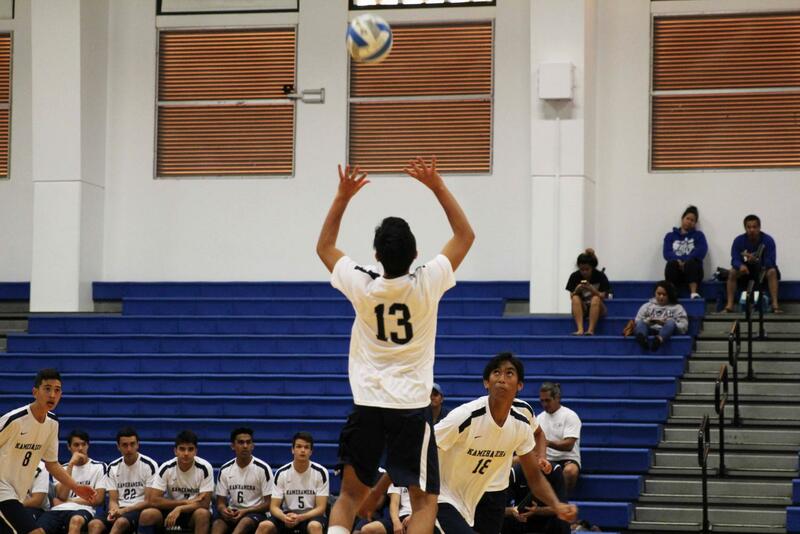 “This year was very different because [the team] had people who haven’t played volleyball before….It was a pretty interesting year,” freshman Jonah Saribay said. The Warriors ended the season with three wins and two losses. The Warriors’ biggest competitor was Lahainaluna High School, who ended their game-winning streak in mid-season. Last year, the boys had five losses and four wins, so in this 2017-18 year, Coach Taylor Awai had the boys work and play together as a team to improve. 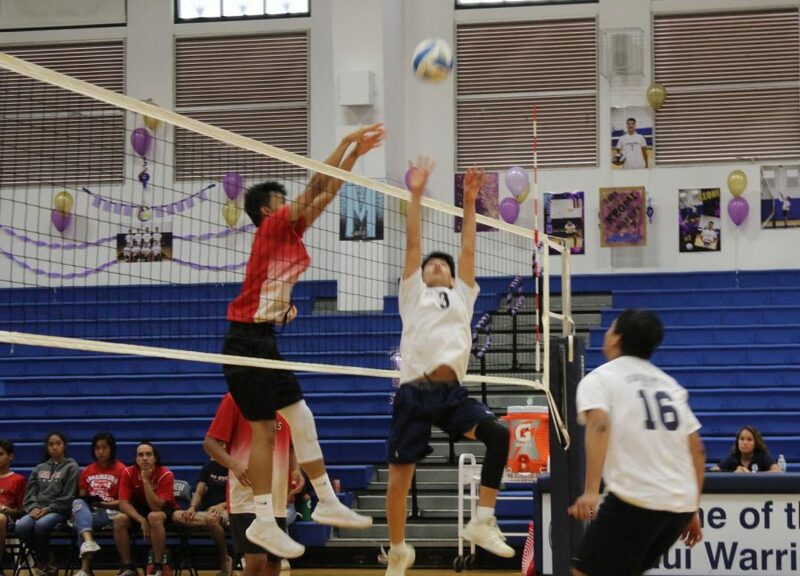 Sophomore Steven Gushiken goes up for a block against Lahaina. Sophomore Malie Watanabe prepares to catch the ball during warm-ups. The Maui Warriors girls softball team used the experience of this year to build up their young athletes. The team consisted of two seniors, three juniors, eight sophomores, and two freshmen. The Warriors had five wins and seven losses, which is an improvement from last season’s record of 14-1. “The goal going into this season was to play aggressive and to have the mentality that we’re good enough to play with the other teams,” senior Kyana Nagasako said. The pitcher for the team was freshman Melia Kama, who will be continuing and training in this position for the next three years. Sophomore Jerriah Solomon is one of the leading hitters on the team. 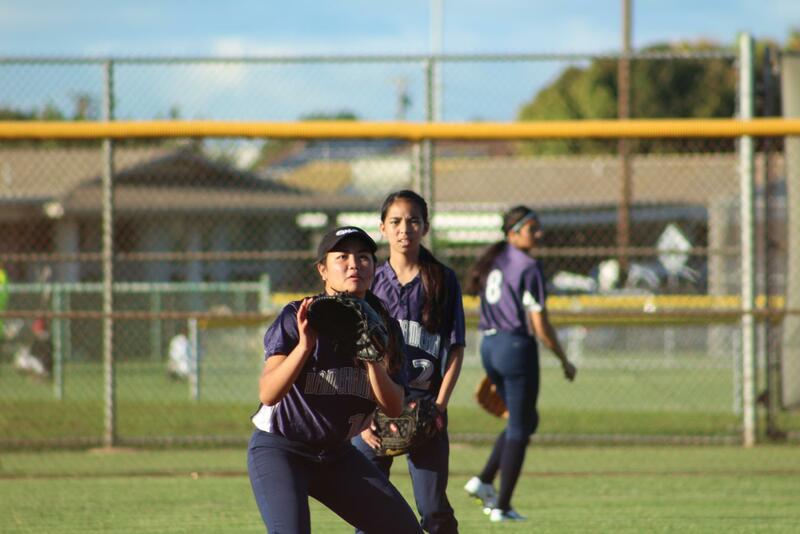 This season, the girls fell short in the semifinals against Lahainaluna losing 19-4 in three innings. They tied for third with Maui High School in the Maui Interscholastic League with an overall score of 5-7-0. Baldwin High School was the MIL champion this year, and Lahainaluna came in second. “[The girls] really committed and started to turn the corner,” Coach Mark Vaught said. Although the Warriors did not make it to the state championship, they showed great improvement from last season. Sophomore Mahie Borge and teammates stop between drills for instructions. 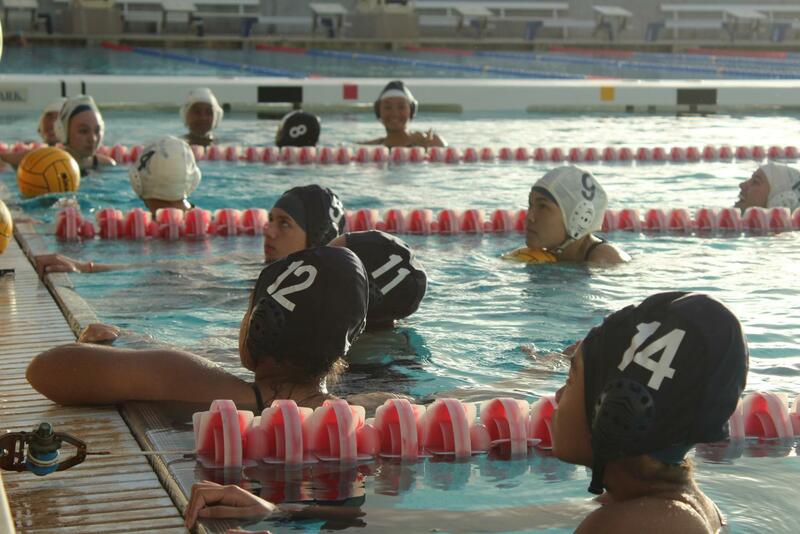 The water polo girls went 0-14 this season, including preseason. A new coach plus a whole new team brought the Warriors a difficult water polo season this year, with no wins and eleven losses in the Maui Interscholastic League. With only five returning players, the rest of the water polo team consisted of first-year members, most playing the game for the first time this season. Right off the bat, assistant coach and previous head coach Allyn Kalaiwaʻa said the season would be a “recovery season,” since most players were still learning the game. Senior Justice Rodrigues receives the Most Outstanding Player award from coach Chris Calvert. Out of the five returning players, four were upperclassmen and the only upperclassmen on the team. The returning three seniors, one junior, and one sophomore eased both the 10 new underclassmen and the new head coach into the season. For returning sophomore Elena “Mahie” Borge, her dedication to the sport easily made her a leader. Like most of the team this year, Borge jumped in blindly last season, her first time in the sport. Borge didn’t only work with the new girls, but she also improved and prepared herself for the season as well. Borge is one of the seven starters and one of the team’s biggest motivators. She received the Leadership Award from her coaches at the end of the season. After the teamʻs improvement throughout this year, Borge said she is ready for next year. Head coach Chris Calvert is also preparing for next year’s season. He held several water polo clinics after school throughout the month of May. The clinics provided those interested in playing, especially middle school eighth-grade girls, a chance to come out to practice, learn, and refine their skills so that next year, the team will not have to face an influx of first-timers again and can get off to a running start.